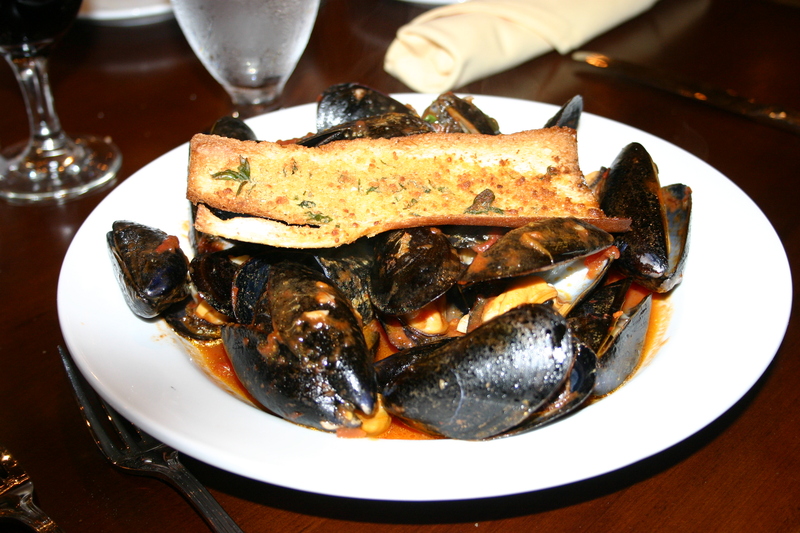 Barone Tuscan Grill in Woolwich, NJ is new;VERY new. It’s the latest edition to the Barone Restaurant mini-empire. Their website has no information on this location except to say it is “coming soon”. The Woolwich/Swedesboro area of southern Gloucester County is a fast-growing area for young families that was blossoming quickly before the real estate debacle took place. It’s evident even now that once the situation improves it’s an area that will continue to see explosive residential growth. My son and his wife (Brian & Jenny) recently moved to this location from PA and we had dinner with them and our friends Jerry and Sue C. along with their son Tim, and his girlfriend, Kristen. We met here at Barone as a torrential summer shower drenched us on our run from the car to the shelter of the restaurant. Inside it was bright and cheery with a full house on this Friday evening. The front of the restaurant is lined with windows while the back features walls with large black and white scenes of Tuscany. The strip mall that houses Barone Tuscan Grill also has a JB Liquors and I was able to pick up a couple of bottles for dinner. 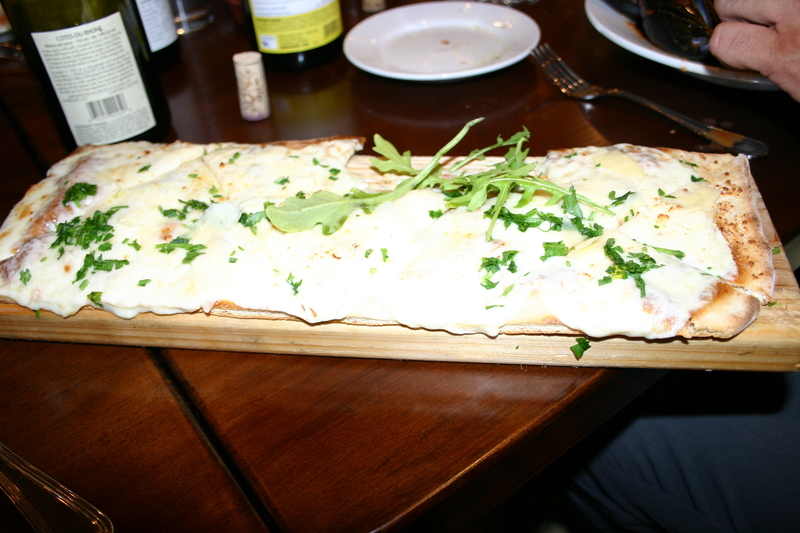 We had the 2006 J Vidal – Fleury, Cotes du Rhone and it went very well with the rich, Italian foods. There were a few other bottles at the table, a German Riesling and a 2008 Falesco, Vitiano, another dependable inexpensive wine that JB’s sell for $11.99. 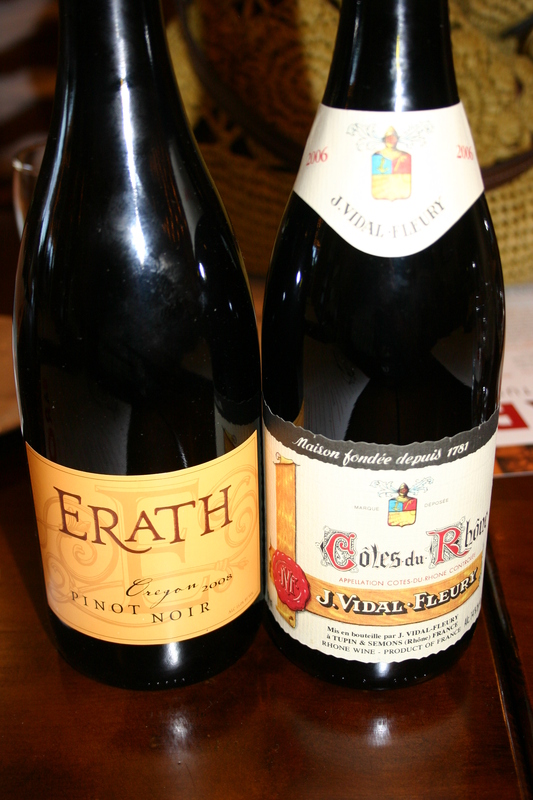 We never did open the 2008 Erath, Pinot Noir, Oregon so that made the ride back home with us. Our server, Stephanie, confessed that she had not opened more than 8 bottles of wine in her short career at Barone Tuscan Grill so we gave her some assistance and told her that it’s a good thing that she admits that up front. She did a good job all night seeing to our needs. We started with a few appetizers for the table, Mussels “Your Way” which in the case was in marinara sauce, Arancini, fried risotto balls stuffed with wild mushrooms and fontina cheese in a parmesan cream sauce and Parmesan Crisp, a flatbread Parmesan Crisp, herbed parmesan cheese with infused white truffle oil and melted provolone. The meal was off to a good start. The rain was letting up and the late evening summer sun was beginning to peek thru the dark clouds which lit up the room. Several of our party mentioned that it was warm in the room. I’m not certain I recall what everyone had as an entree but I will do the best I can. 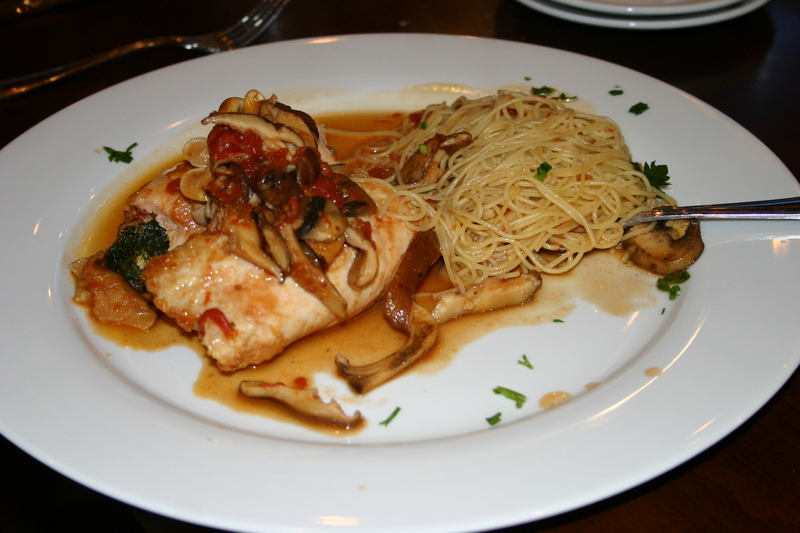 I wanted the meatloaf entree but was informed that it had been devoured by earlier diners so I went with my second choice, Pollo Rollatini, chicken breast stuffed with prusciutto, spinach and fontina cheese with a rich mushroom sauce. A nice portion of capellini accompanied the dish. It was tasty and a good-sized portion and I took half home and finished it for dinner just moments ago. My only minor gripe is that there were too many mushroom present but that’s just my anti-mushroom bias and many would take that news as a plus. 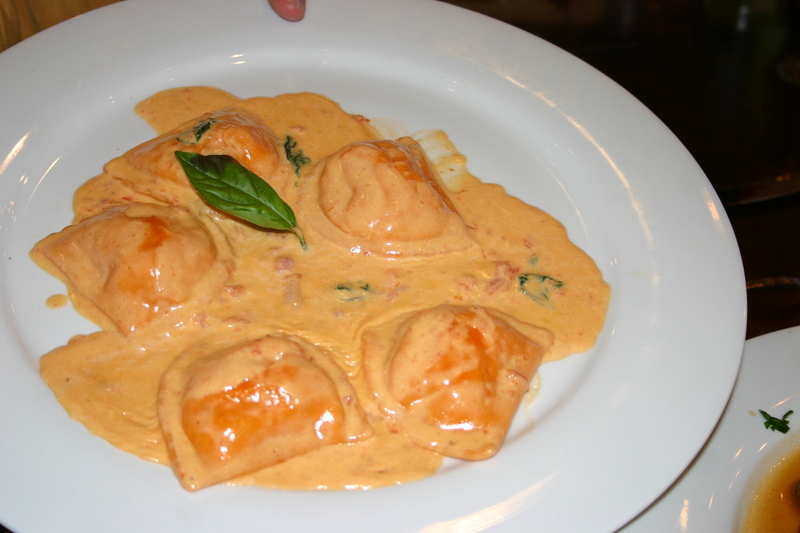 Kristen ordered the Ravioli Rosa, fresh lobster-filled hand-made ravioli in a pink basil cream sauce. This dish had beautiful color and Kristen thoroughly enjoyed what she finished before also taking some home for later. 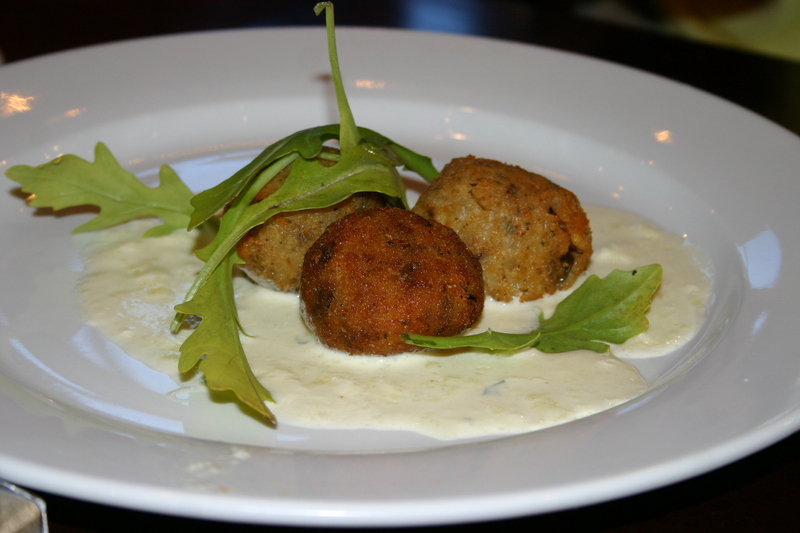 Kathy can never pass up an eggplant dish so she predictably ordered the Melanzane Rollantini, eggplant rolled with ricotta and basil and served with mozzarella cheese. 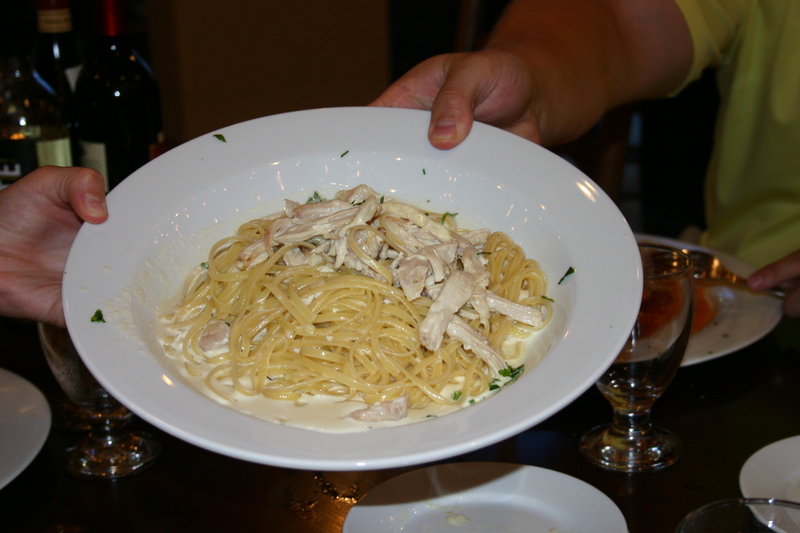 She chose the vermicelli as her side pasta dish and she also found the serving large enough to provide a second meal. My daughter-in-law selected the pasta topped with crabmeat while my son had the Tuscan Alfredo, chicken in a lemon zest alfredo sauce. Both were a little disappointed in their meals feeling it lacked a lot of taste. 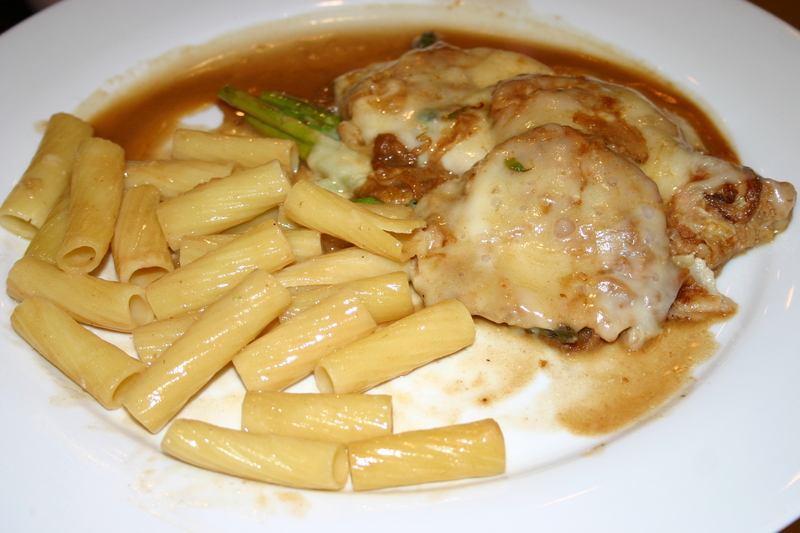 Sue had the Vitello San Angelo, egg battered veal with asparagus and mozzarella in a madiera demi glace. 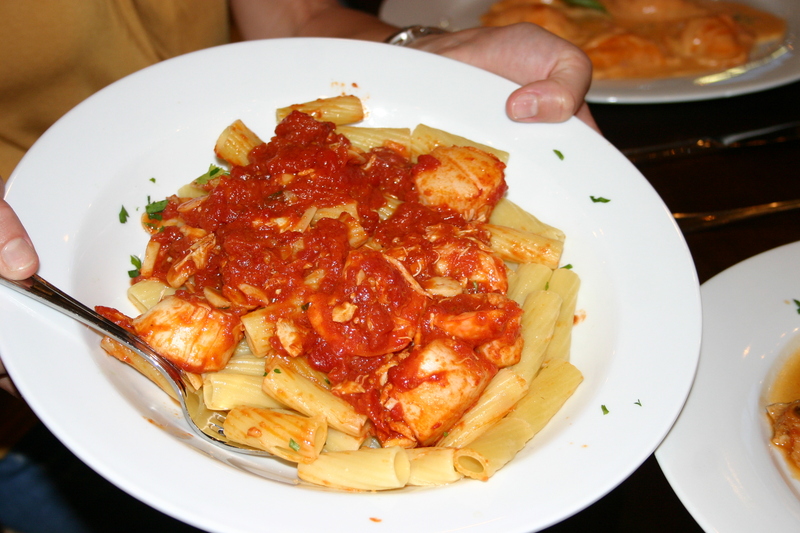 I thought her dish looked great and the ziti was a nice addition to the plate. Tim was not in adventurous mood and he ended up with the old reliable Chicken Parmesan. For Kristen and Tim, the leftovers they took home will be there last American meal for three weeks as they left today for Australia and a fun-filled summer vacation diving off the Great Barrier Reef. 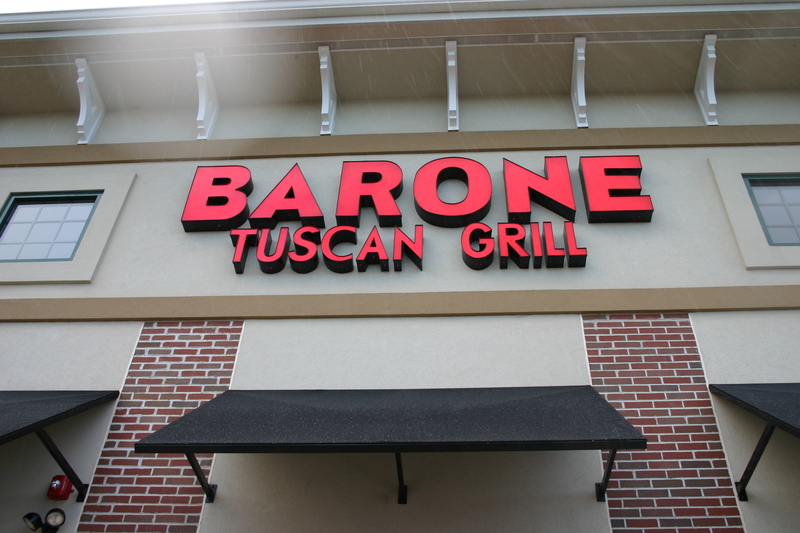 Because Barone Tuscan Grill (I want sooooo bad to called it Barone’s) is located so close to my son and his wife’s new home I am sure this is not our last visit to this place. They are experiencing the usual “new opening” pains but they are trying and the place certainly shows potential. The prices are reasonable and the portion sizes are good. 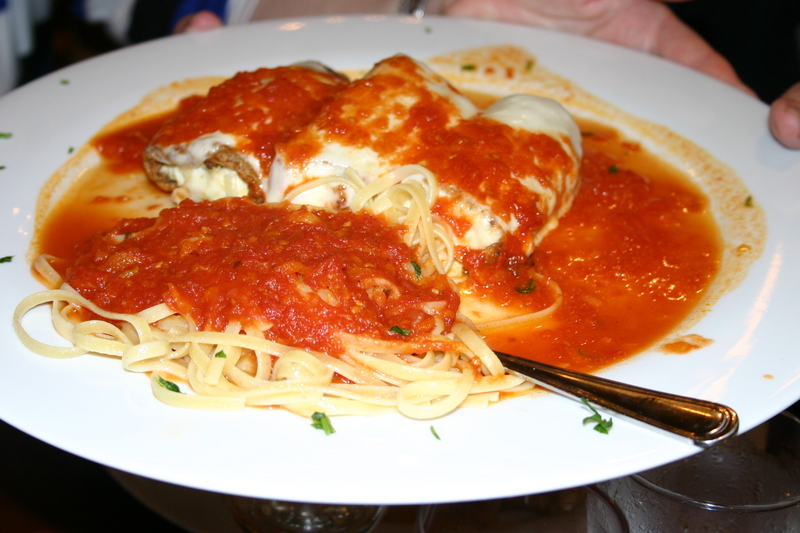 There is a review of one of their other restaurants, Villa Barone, in Collingswood, located elsewhere on my blog. There is a hierarchy within the world of wine geeks. I’m afraid I am not in the upper echelon of wine geeks. There are probably a few reasons for that but the primary one might be that my budget does not enable me to drink the high end wines very often and precludes me from drinking the highest of the high at any time. At least, so far. One never knows when a wine miracle might take place. If I were a member in good standing of the highest echelon of wine geeks my favorite wine might be one of the true classics like Chateau Petrus, Screaming Eagle, or a Domaine Romanee Conti. Unfortunately, none of those grape spectaculars has ever met my palate. I have had the opportunity to taste a couple of the first growth from Bordeaux at a wine tasting but they didn’t impress me all that much. The wine that did make me go “wow”, and it has done so on more than one ocassion was the 2001 Shirvington Shiraz from McLaren Vale in Australia. This beauty from the land of Oz has it all; a nose of incredible scent that simply intoxicates the senses. There is a bouquet of rose petals, soft cherries, ripe raspberries, chocolate and even cotton candy. The first sip brings a powerful taste of an array of red and black fruits mingled with that same cotton candy with a touch of licorice all balanced perfectly with tannins that are soft and warm. The finish continues for a full 60 seconds and you just know you are experiencing near perfection in a wine. The 2002 Shirvington was equally enjoyable and was rated 99 points by Robert Parker. I believe the 2001 garnered 98 points. Both of these superb wines were crafted by the outstanding Aussie winemaker, Sparky Marquis. He no longer makes Shirvington as he was replaced by Kim Johnston in 2004. The current Shirvingtons are still excellent but none have achieved the greatness of the 01 and 02’s. Sparky Marquis and his wife Sarah are now owners and winemakers for a brand called Mollydooker and I will write at length on those excellent products in a future post. There are still a few of the 2001 and 2002 Shirvington’s available online at prices starting around $125.00. If you can afford them and want to experience a truly great wine then I would suggest you grab one or more before they are extinct.